Kenney & Ross Limited was founded in 1945 by Mr. Job Kenney and Mr. Reginald Ross who were two local entrepreneurs. 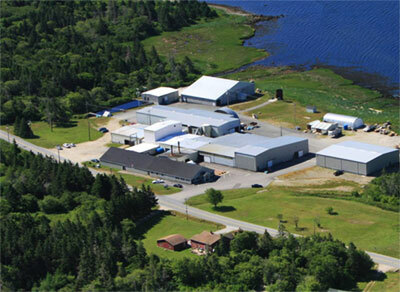 They believed that the province of Nova Scotia possessed a rich source of marine by-products that could be processed for added value. During their early years in business, they manufactured a number of marine products ranging from cod liver oil to pet food to fish gelatin. In the early 1960’s Robert Norland of Norland Products Inc. in New Jersey, asked them to produce a technical grade fish gelatin. Color television was becoming popular, and the K&R fish gelatin soon became the standard gelatin used in the US and Europe to precision manufacture a metal part inside the color picture tube. This lasted for many years but with changing technologies, the fish gelatin was ultimately replaced. New technologies have occurred since then, and this same gelatin and its special characteristics are now used in the manufacture of solar panels for generating electrical energy. In the early 1970’s more technological advances allowed the fish gelatins to be used in applications as reagents for laboratory tests, as additives for producing copper foil for printed circuit boards and as additives for producing polyvinyl chloride. In 1990, K&R began producing kosher, a pharmaceutical grade, fish gelatin for a major vitamin and supplement company. K&R remains their sole source of supply even after 20 years. The most recent pharmaceutical application for our gelatin is in the manufacture of quick dissolving tablets for prescription drugs. In the mid 2000’s, K&R began producing their Hydrolyzed Fish Collagen. Our continued improvements make the collagen well received by companies world-wide. K&R is one of the few companies that only manufacture marine gelatin and collagen having no possible contact with bovine or porcine products. This prevents any possibility of BSE or cross contamination. In addition, the K&R products are also able to be certified as Halal and Kosher by strict agencies.